At the heart of endless plains of Vojvodina, stands Fruška gora Mountain. Mountain which once represented the island in the Pannonian Sea, today extends above the Danube river, occupying northern part of Srem region all the way to the Croatian border in the West. Mountain is covered with dense deciduous forests, and its importance is immeasurable for mountaineers, hikers and for all of us who love to spend free time in the nature. Someone who visits this mountain for the first time will probably notice the markings on trees in the form of heart. This is a certain sign that you are on one of the 19 marked paths, particularly marked for purpose of ’’Fruškogorski Marathon’’, which takes place in late April each year. Organizers of the marathon claim that solely to sincere love for the nature and thanking to friendship of good people this marathon survived over the years. One of those marathons made Fruška gora my second home backyard. To see all of its beauty, I suggest that you find a comfortable shoes and to step on one of the many hiking trails. In addition to comfortable footwear (ideally get trekking shoes, but if you don’t have those, firm sneakers would do just fine), it would be good to pack sandwiches and water for the day in a backpack, as well as a jacket in case of wind. Special mountaineer equipment is not required. Fruška gora is a mountain with mild configuration of terrain and as such is not difficult for hiking. Hikes on Fruška gora can be very diverse. Paths lead through pastures and orchards spread around the slopes, some of those take turn to medieval monasteries hidden all over the mountain, others can take you to forgotten villages and through old forests of beech and lindens to one of the many picnic areas on the mountain. My favorite trail starts from the central part (Iriški venac, Kraljeva stolica) and through the forest takes down to the Ethnic village Vrdnička kula. There is no better place for rest! Ideal opportunity to make coffee break is on the terrace of a restaurant located at the very edge of the forest with a beautiful view towards the village! The same restaurant offers very delicious homemade strudel with cherries (order two, believe me!). It is easy to get carried away here, but I manage to resist the temptation every time and the hike continues through Vrdnik, eventually re-entering old forest. The forest here is something special! Tall trees are leaning over the valley where stream is running quietly. While walking the trail above the stream, the silence is disturbed only by the sound of leaves under the shoes, while the whole ambience irresistibly reminds of a place that could be visited by elves. At the moment when you hear remote roars of traffic from the road above, you’ll realize that you have reached the end of this magic route. There is a special place on the slopes of Fruška gora known to very small number of people, and which is worth of being found. On the west side, away from the beaten marked trails, is the best-kept secret of Fruška gora: Kišelez meadow where shepherds still tend their sheep! That kind of scene is almost forgotten in this part of Vojvodina, while the entire landscape looks significantly different from the rest of the mountain. Kišelez consists of several glades, edged by forest, where grass is not higher than few centimeters. The only problem may represent shepherd dogs and because of them you should be careful when choosing the point of access to the meadow, nevertheless it is really worth to come here and spend the day. There are many more places which deserve their own section in this story. Starting from Andrevlje, Letenka, Zmajevac, Stražilovo with mountain hut and Villa Ravne that once was visited by ex-Yugoslavia president Tito even, through the Valley of chestnuts and finally Iriški venac. There are so many of those places, but I’m sure you’ll find your own special place where you’ll be returning gladly each time. Equally beautiful in all seasons, Fruška gora is the ideal location for a break from city life, a place for spending time with friends and a place to re-establish contact with nature. Although Fruška gora has much to offer, perhaps the most valuable is peacefulness which can be sensed during the stay in forest, which, after all, cannot be described with words. 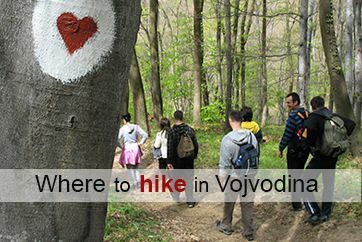 If you are looking for an idea where you could hike in Serbia try these hiking tours which we designed.